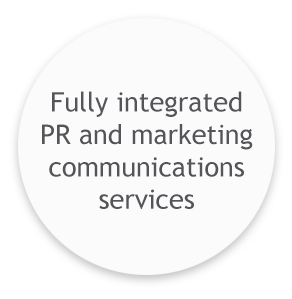 We provide a fully integrated PR and marketing communications service – from stakeholder insight, communications and campaign planning, to expert implementation and follow-up evaluation. Some of our clients require complete campaigns or programmes, while others choose bespoke services such as research, message development, media relations, copywriting or strategic planning. Through our network of trusted partners we can also provide fully integrated services such as public affairs, advertising, digital services, and specialist research, offering a convenient single point of contact for all your marketing communications.